Department of Civil Engineering, Univercity College of Engineering JNTUK. 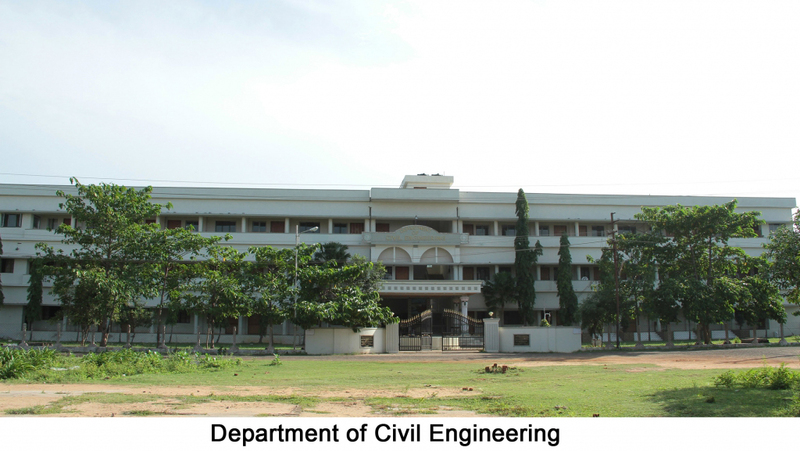 Department of Civil Engineering was established in the Year 1946. The Department has created its own reputation through its teaching, research, consultancy and extensive activities. It offers Undergraduate program in Civil Engineering and Postgraduate Programs in Civil Engineering, Soil Mechanics and Foundation Engineering. The department is equipped with strength of materials and concrete technology, fluid mechanics and hydraulics machinery, geotechnical, environmental, surveying, transportation engineering, engineering geology and CAD and GIS laboratories. The department has advanced civil, computer application and geotechnical laboratories for post graduate students to perform research in respective areas. Civil engineering laboratory has compression testing machine with maximum capacity of 300t, tensile testing machine and beam bending testing machine etc. to perform studies on different mixes of concrete and aggregates etc. The computational laboratory has STRAAP, STRUDS, MATLAB, Plaxis softwares etc. to perform numerical studies in civil and geotechnical areas. The advance geotechnical laboratory has cyclic tri-axial testing machine, large box shear apparatus to perform studies on various samples of soils. To produce competent civil engineers with a capacity to handle challenges in the field of civil engineering and also to perform innovative research for the societal needs with professional ethics. M1: To produce high quality learners who are globally competent and professionally skillful in the field of civil engineering. M2: To offer educational programmes that imparts inventive knowledge with high levels of ethical and human values. M3: To provide a platform to acquire and implement innovative ideas in research and development. M4: To build up the state-of-the-art laboratories and centers of excellence in different areas of civil engineering. M5: To train the students and faculty to update their knowledge in emerging technologies to meet industrial requirements. PEO 1: Impart basic technical knowledge and skills for specialized careers in civil engineering related fields that cater to the global needs. PEO 2: Provide expertise in carrying out project works in civil engineering by using state-of-the-art basic computing and experimental techniques and to develop interdisciplinary approach. PEO 3: Train the student to possess good communication and presentation skills with ability to work in teams and contributing significantly to the technological development of the Nation. PEO 1: Able to solve mathematical/numerical problem. PEO 2: Able to analyze trusses, beams, frames. PEO 3: Estimation of forces, analysis of multi degree of freedom systems using mathematical approaches such as static quasi static and dynamic methods. PEO 4: Design of Structures to contribute in the development of the society. PEO 5: Application of experimental techniques on structural evaluation. PEO 6: Able to analyze and design of structure under different types of loads. PEO 7: Optimization of structures and presentation of the project done with ethics. PEO 1: Impart advanced technical knowledge and skills for specialized careers in Geotechnical Engineering and related fields that cater to the Global needs. PEO 2: Provide expertise in execute complex geotechnical projects by using state-of the- art computing, numerical and experimental techniques and to develop interdisciplinary research. PO 1: Able to solve Mathematical /Numerical problem. PO 2: Able to analyze Trusses, Beams, Frames. PO 3: Estimation of forces, Analysis of multi degree of freedom systems using Mathematical approaches such as Static quasi static and Dynamic method. PO 4: Design of Structures to Contribute in the Development of the Society. PO 5: Application of Experimental Techniques on Structural Evaluation. PO 6: Able to Analyze and Design of structure under different Types of loads. PO 7: Optimization of Structures and presentation of the Project done with Ethics. PO 2: Able to select suitable foundation of different structures and retaining structures and analyze and design these structures and for different sub soil conditions and estimates its stability. PO 3: Able to select the suitable Ground improvement technique to improve the ground for different sub soil conditions by considering the environmental and social aspects. PO 4: The graduates can use research based knowledge and research methods to conduct experiments, to analyze and interpret experimental data. PO 5: Able to use advanced Materials, equipment, instruments and Technologies to mitigate the problems posed by the ground at difficult soil conditions.